This area is filled with great opportunities for outdoor recreation! One of our most popular articles of all time is our Ultimate Guide to Kids’ Indoor Fun in the Reston Area. The next logical step is a guide to outdoor fun, but this time we didn’t limit the excitement to kids’ activities. Here are our favorite ways for anyone to spend a beautiful day in Reston, Northern Virginia, and the DC area. Bookmark this page, and check back whenever the sun is shining. Don’t miss out on any of the fun. 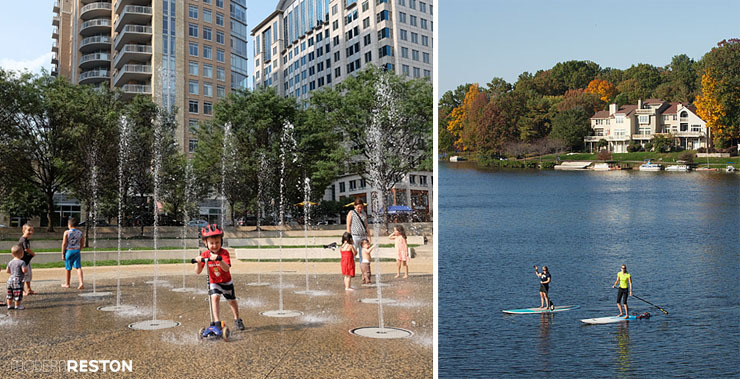 Lake Anne Plaza (left) and Reston Town Center (right) are two must-see locations in Reston. Roer’s Zoofari in Reston is the new name for the Reston Zoo. In addition to a petting zoo and reptile house, they offer wagon rides through a field filled with grazing zebras, camels, ostriches, and much more. Walker Nature Center in Reston sits on 72 acres of woodlands with a mile of trails. A pond, picnic pavilion, interpretive signs, and an indoor education center enhance your visit. FREE. Frying Pan Farm Park in Herndon is a working farm preserved in early 20th Century process, with animals, farm equipment, wagon rides, and children’s play areas. FREE. Colvin Run Mill in Great Falls is a restored 1811 water mill with a nature trail, general store, guided tours, and several special events. FREE to explore, tours are extra. The trail around Lake Thoreau is about two miles long, with wonderful scenic views. Lake Thoreau in Reston is circled by a two-mile trail that goes through neighborhoods, along the waterfront, and through South Lakes Village Center. FREE. Lake Anne in Reston is circled by a path that is 1.5 miles long, and goes through neighborhoods, along the waterfront, and through Lake Anne Village Center. FREE. Sugarland Run Stream Valley Trail in Herndon is a paved path along a stream through shaded areas, with some stream crossing along the way. FREE. Washington and Old Dominion Trail (W&OD) is a 45-mile paved trail that runs from Arlington to Purcellville, and passes through Reston. This is the place to go for long bike rides or marathon training. FREE. 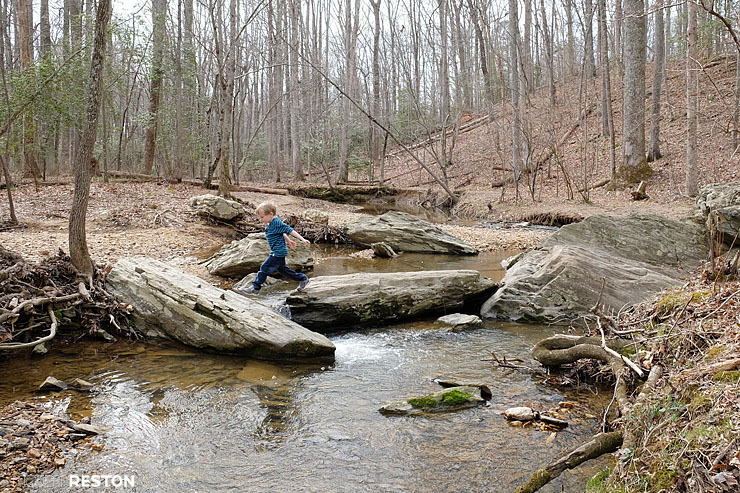 Reston’s Fred Crabtree Park is a quiet place to hike along wooded trails and a rocky stream. Fred Crabtree Park in Reston is a quiet and secluded park with hiking trails along wooded streams. FREE. Riverbend Park to Great Falls Park in Great Falls is a flat and beautiful 3-mile roundtrip walk along the Potomac to the Great Falls viewing areas. FREE if you park at Riverbend Park. Scott’s Run Nature Preserve in McLean is a 2.3-mile loop that includes a waterfall, stream crossing, and cliffside views of the Potomac. FREE. Difficult Run in Great Falls is a 5-mile hike along the Potomac, through wooded areas, and to Great Falls National Park. FREE. The Billy Goat Trail in Potomac, MD is a 7.3-mile rocky and difficult hike on the Maryland side of Great Falls Park. It requires rock scrambling and steep climbs. FREE if you park in Carderock. Seneca Park in Great Falls offers several wooded trails that connect to the Potomac Heritage Trail along the river. FREE. Golf Course Island offers one of Reston’s biggest playgrounds, with separate areas for toddlers and older kids. 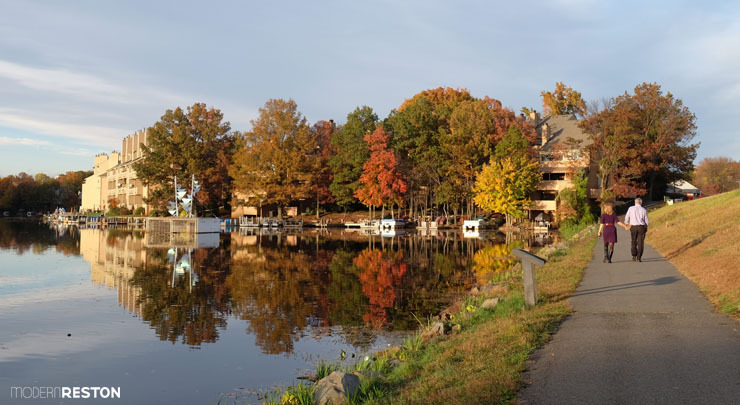 Lake Fairfax Park in Reston is a 476 acre park with a lake, boat rentals, campgrounds, playing fields, picnic pavilions, a water park, a skatepark, and miles of trails for walking or mountain biking. FREE. Brown’s Chapel Park in Reston is located next to Lake Newport. It has playing fields, tennis courts, fitness stations, a shaded playground, and restroom facilities. FREE. Baron Cameron Park in Reston has a dog park, playing fields, and a playground. FREE. Golf Course Island Recreation Area in Reston has a playground with swings, a fenced-in area for toddlers, and a large climbing structure for older kids. There are also basketball courts and a picnic pavilion. FREE. North Hills Picnic Pavilion in Reston is a large, covered picnic area with grills, a playground, and a small grassy field. FREE. Reston North Park in Reston is located behind Home Depot, and offers two playgrounds for different age levels, as well as soccer and baseball playing fields. FREE. 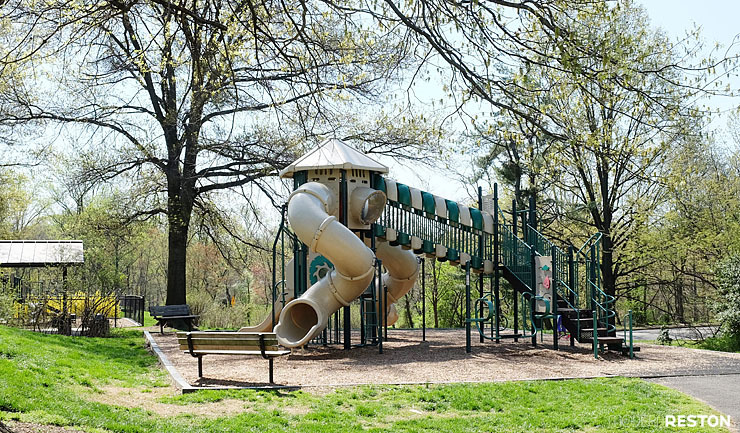 Bready Park at the Herndon Community Center has a large playground with a separate area for toddlers, as well as playing fields and restrooms. FREE. Great Falls Grange in Great Falls is a large and fantastic playground with plenty of shade. There are also playing fields and picnic tables. FREE. Clemyjontri Park in McLean is a Fairfax County treasure — a massive playground with equipment for children of all abilities. There is also a carousel, picnic pavilion, and restroom facilities. FREE. With lakes, a water park, splash pads, and several pools, Reston has tons of ways to splash around on a hot day. Water Mine Family Swimmin’ Hole in Reston is a water park with slides, sprays, a lazy river, floatables, and an interactive water playground. Lake Anne Boat Rental in Reston offers hourly rental of pedal boats, canoes, and kayaks. Lake Fairfax Boat Rental in Reston offers hourly rental of pedal boats, as well as tour boat rides. Surf Reston in Reston offers paddleboard instruction, SUP yoga, and SUP lacrosse. Children’s Fountain at Reston Town Center in Reston is an interactive fountain in Town Square Park. FREE. Lake Anne Plaza Fountain in Reston is a sculpture with several sprays and a wading pool. FREE. Reston Association Pools can be found in 15 locations around town, each with different amenities. RA pool pass required. Splash Pads in Reston can be found at a variety of locations, including Dogwood Pool, Polo Fields, and Lake Anne Park. National Monuments in DC are really the ultimate sites to visit on a pretty day. When you are lucky to live near the nation’s capital, be sure to make the most of it whenever you can. FREE. Georgetown Waterfront in DC is a beautiful area of the city with great views of the Potomac. Enjoy fountains, rain gardens, and sunset views. While you’re there, get dinner at one of the waterfront restaurants or rent a kayak or paddleboard. FREE to explore. The Yards Park in DC is a recent addition to the Capital Riverfront neighborhood, with water play areas, an iconic bridge sculpture, dining, and riverfront paths. FREE to explore. Old Town Alexandria in Alexandria is a preserved colonial historic district with shopping, dining, galleries, and a riverfront park. FREE to explore. Mount Vernon in Alexandria is the home of President George Washington. Admission to the estate includes lots of outdoor fun, including gardens, waterfront trails, working farms, and much more. Manassas National Battlefield in Manassas is a must-see for history buffs, and includes miles of trails and beautiful spring wildflowers. FREE. Bull Run Regional Park in Centreville has a waterpark, picnic areas, flat paved trails, hiking trails, and spring wildflowers. FREE for county residents. C&O Canal in DC and Maryland is a 184.5-mile long riverside trail for hiking, biking, and camping. FREE. Burke Lake Park in Fairfax Station has a flat, 4.7-mile trail around the lake. In the warm months, there is also a kiddie train, carousel, ice cream parlor, mini golf, and much more. FREE for county residents. Huntley Meadows Park in Alexandria is a fascinating wetlands preserve with lots of wildlife viewing opportunities. FREE. Harpers Ferry in West Virginia is a beautiful and historic town with hiking, dining, shopping, and educational fun. FREE to explore. National Zoo in DC is a world-class zoo operated by the Smithsonian. FREE. What did we miss? We are always looking for fun ideas of things to do. Please let us know in the comments! This is great. Thank you. Is Lake Anne Park in the same complex as Lake Anne? I am trying to locate where the splash pad would be.